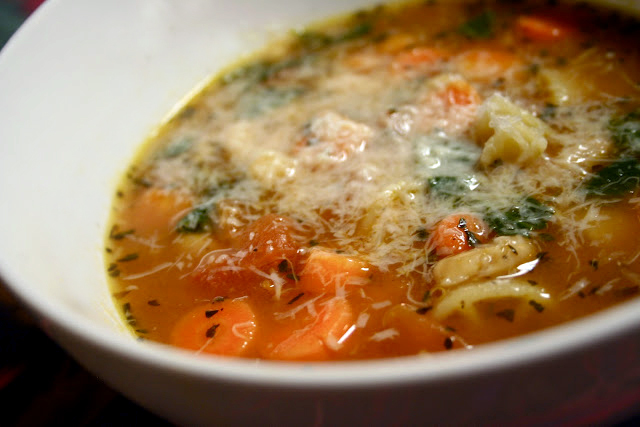 I've never been a huge fan of tomato-based soups, but minestrone is a different story. I love the variety of the ingredients and the simpleness of the soup. The really reason this soup hit the spot though is because I've been fighting off a cold for the past few days. Nothing cures the cold blues like some hot soup. Oh and did I mention the flavor's great? 1. Using a large, heavy stock pot, saute onion and carrots in olive oil on medium heat about 4-5 minutes. Add garlic and continue to cook for another minute. 3. Add fresh tomatoes, fresh zucchini or spinach, chicken broth and water. Bring to boil. Add pasta and cook for 7-9 minutes until al dente. 4. Stir in tomato paste, beans and basil. Cook just until combined. 5. If needed, add a little more water to the soup. 6. Serve immediately with freshly grated Parmesan cheese. *You can add a variety of vegetables to this soup. Adding one to two cups of whatever is in your fridge, such as zucchini, other squash, spinach works well. Note: I didn't have tomato paste, but I did have a small can of tomato sauce that I used instead. I used 3 Tbsp. of it, but I'm planning on trying tomato paste next time.